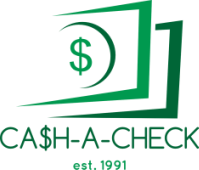 We offer immediate cash for checks made payable to your business! Cash checks payable to your business. CASH-A-CHECK understands how important the instant availability of funds is to the success of your business. While banks place holds on checks you deposit, effectively freezing your money until the banks are ready to release the funds, we will instantly provide you with the cash you need by immediately cashing all checks payable to your business. There's no limit to the check amounts. We have 25 years of experience and can help you cash checks to your business with friendly, fast, and reliable service.